There were 10 scheduled sessions planned for the day, beginning at 8.30am, with 9 different expert instructors. 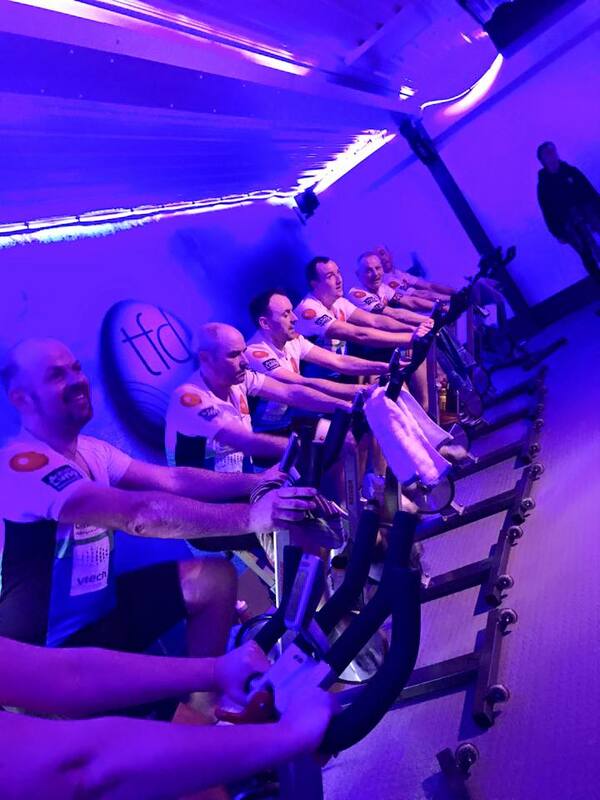 Tfd members and guests alike could pre-book to join the classes, with 4 x PEAKY CLIMBERS attending each one. Arriving at 8am sharp, the PEAKY team for the day were raring to go. With only Simon Haly missing due to a very busy Mother’s Day weekend of back2back bookings in the pub, the 7 PEAKY CLIMBERS were all set up and raring to go. The first session had Ben, Nobby, Cricky and Allen leading the way in what was a packed session. It was warm, it was hot and it was frantic – Emily certainly didn’t hold back! Ear bursting music, shouts, cheers and full on action by the whole class meant everyone was sweating buckets at the end. There was no stopping between classes – instructors changed at the end of their session it was then immediately back on again. From the second class onwards the PEAKY CLIMBERS attended each class on mass. Macca, Stewie and JB grabbed their first session and once he acclimatised himself, JB went from strength to strength as they day went on. Hannah and Blake’s classes were tough, with Blake being incredibly unforgiving with the continual ‘crouches’ being thrown in far too often. The classes passed in a blur. The PEAKY CLIMBERS kept up the pace, stamina and noise throughout each session. Every one of the attendees were puffing, panting and sweating non-stop throughout every class. Instructor John’s session was particularly tough as we passed 6 hours in the saddle, with extremely loud renditions of various Queen songs keeping everyone’s minds of their aching legs! By this time Nobby and Stewie were struggling with what I will only say was overly ‘sweaty bottoms’ – Nobby had a quick pit stop to change into some dry shorts ahead of the ultimate final session. A PEAKY CLIMBERS motivational group hug ahead of the final spin class was short lived – music on…we were ready to go! This final session was once again absolutely packed. 3 instructors – Emily, Steffi and Blake all lined up together to take the final session together and all the PEAKY CLIMBERS were in attendance…tired…but committed to finish the day’s challenge in style. It was tough. Very hard, very demanding and a real challenge on the mind and body. Great fun though as everyone in the room kept pushing, encouraging and motivating each other to push on through to the end. It was a tremendous day and a HUGE, HUGE thank you must go to Lisa and her fantastic team at Tfd for managing what was a hugely successful day. Funds raised on the day for the PEAKY CLIMBERS was £386.80, so a massive thank you to everyone who kindly donated. 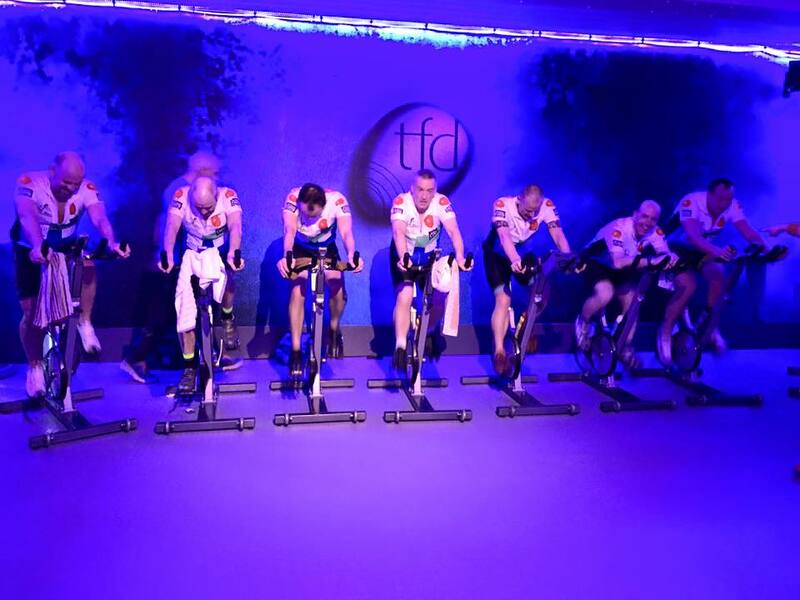 Only 2 weeks to the Mallorca Training Camp…let’s hope the Spinathon training has helped!